The United Nations Children’s Fund (UNICEF) reported on Tuesday that nearly 8 children have been killed or wounded every day in the course of the air assault on Yemen spearheaded by Saudi Arabia, which began earlier this year. The bombing has been more or less continuous, with multiple ceasefire agreements and so-called humanitarian pauses breached almost as soon as they were announced. Saudi Arabia and its allies have been seeking to push back the Houthi militias that seized control of most of Yemen’s western provinces in March, including the southern port city of Aden. The countries contributing forces to the Saudi-led war include Bahrain, the United Arab Emirates (UAE), Egypt, Jordan, Kuwait, Morocco, Sudan and Qatar. In less than five months, coalition jets have launched thousands of air strikes. While the attack is nominally headed by Saudi Arabia, the Obama administration has made it possible by providing coalition jets with midair refueling and both intelligence for targeting strikes and the bombs necessary to carry them out. The coalition has deployed American-made laser-guided bombs as well as internationally outlawed cluster munitions. Washington recently more than doubled, from 20 to 45, the number of advisors working at joint military operations centers in Saudi Arabia and Bahrain. US spy satellites and drones relay live video of bomb targets to the coalition’s operations centers. The Saudi monarchy and the US are seeking to reinstate former President Abd Rabbuh Mansour Hadi, who was forced to flee the country in the face of a Houthi assault on Aden. Military forces loyal to former longtime dictator Ali Abdullah Saleh have been backing the Houthis, facilitating their advance from their northern stronghold of Sadaa to the capital Sanaa, and finally all the way to Aden. 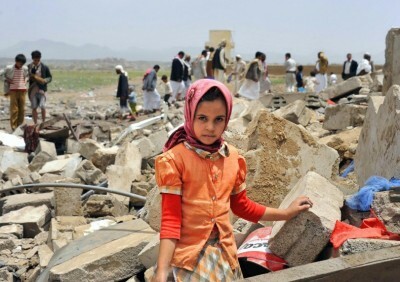 According to official UNICEF tallies, there have been more than a thousand child causalities as a result of the unrelenting aerial assault by coalition jets and fierce fighting between pro-Houthi and anti-Houthi forces on the ground. Since March 26, at least 398 children have been killed by bombs and bullets, with a further 605 wounded. Children account for one quarter of the officially counted casualties so far. Months of air strikes and fierce fighting on the ground between pro-Houthi and anti-Houthi forces have devastated much of the country’s infrastructure, killed more than 4,000, and plunged tens of millions into a dire humanitarian crisis. Ten million children, approximately 80 percent of the country’s population under 18 years old, are in urgent need of some form of humanitarian aid. With at least one quarter of health facilities no longer providing vaccinations, at least 2.5 million children are at risk of contracting measles, a highly contagious and often deadly disease. With electricity knocked out in many places and severe fuel shortages, at least 20.4 million Yemenis lack access to clean drinking water, putting many at risk of water-borne diseases such as cholera. Without a safe source of water, 2.5 million children are at risk of diarrheal diseases and another 1.5 million could fall victim to acute respiratory tract infections. UNICEF also reported that at least 1.8 million children are falling behind in their education, as nearly 400 school buildings have been damaged or destroyed by air strikes and artillery shelling. Another 346 school facilities are being used as shelters for displaced families or have been requisitioned by armed militias. The report describes eight Saudi coalition air strikes in southern Yemen that killed 141 civilians and injured 101, mostly women and children. Amnesty International reports numerous strikes that apparently deliberately targeted civilians and non-military targets, including schools being used as shelters and food markets. An air strike on July 24 on dormitories housing workers at the Steam Power Plant and their families in the southwestern city of Mokha killed 63 people and injured another 50. Amnesty’s researchers found no indications that housing units had been used for any military purpose by the Houthis. A coalition air strike on July 9 killed ten members of the Faraa family in the village of Tahrur, north of Aden, when a bomb was dropped on the Mus’ab ben Omar school. At least a dozen families had taken up shelter in the school after being displaced by fighting. Again, the Amnesty researchers found no evidence that the building had ever been used for military purposes. On July 6, the Saudi coalition dropped bombs on a livestock market in Fayush, killing up to 40 people and injuring many others. Residents who survived the attack reported a normal day of buying and selling of goats, sheep and other animals until the bombs fell. On the same day these reports were released, Saudi coalition jets launched an attack on the port in the city of Hodeida. This port had been the main location for receiving deliveries of emergency aid for the country’s northern provinces. According to local officials, four cranes used for loading and unloading ships were destroyed, while nearby warehouses were also bombed, bringing work at the port to a halt. The anti-Houthi forces on the ground backed by Saudi Arabia, known as Popular Resistance Committees, are composed of military units loyal to Hadi, members of the Islamist Islah party, which is affiliated with the Muslim Brotherhood, separatist fighters from the Southern Movement, and fighters from both Al Qaeda in the Arabian Peninsula (AQAP) and the Islamic State (ISIS). Thousands of Saudi and UAE troops have been deployed to Yemen to assist these forces in the push against the Houthis, which has gained momentum with the recapture of Aden and the nearby Al Anad airbase by pro-Hadi forces at the end of July. Defense News reported on August 4 that, in advance of the offensive that retook Al Anad, 2,800 Saudi coalition Special Forces had been deployed in Aden along with LeClerc main battle tanks and other armored vehicles operated by the UAE. So far, at least five UAE troops have been reported killed in the fighting. In Yemen, the United States is in a de facto alliance with AQAP and ISIS against the Houthis, despite being officially at war with AQAP and continuing its campaign of drone strikes against the group’s leadership in Yemen, while it carries out daily air strikes against ISIS forces in Iraq and Syria. The Saudi coalition has refrained from launching any air strikes against AQAP forces, even as it has taken control of large portions of the eastern province of Hadhramaut, including its main city Mukalla, as well as portions of Abyan province. The US carried out a drone missile attack on August 12, killing 5 alleged AQAP members driving on the highway from Mukalla to the nearby city of Rukob.